When telling the story of baby Moses being left in a basket in the river by his mother, I like to focus on the theme of safety. Here is the prayer activity we ended with. It was so easy but felt so significant! You will need: cupcake liners (one per child, aluminum or waxed work best), mini pom poms (one per child), a large tupperware container filled with water (or several containers if you expect a lot of people). 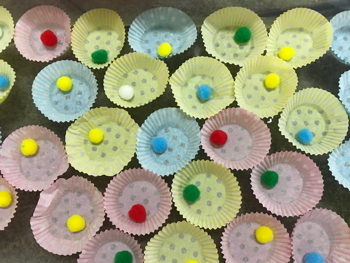 Before the lesson begins, put one pom pom in each cupcake liner. Talk about people who keep us safe, just like Moses’ mom tried to keep him safe from the Egyptians and then safe on the water. Are there any times when God has kept you safe? Who do you know who needs help to stay safe at the moment? (We had lots of suggestions like homeless people, people who were going to have an operation, people who were going on a journey). Invite everyone to take cupcake liner with a pom pom in it and think about someone who keeps them safe or someone who needs help to stay safe. Encourage each child to pray, either saying thank you to God for protecting them or asking God to help their loved one stay safe. When they have prayed, ask them to set the liner on the water as a sign that God has heard their prayer. This post first appeared at Flame: Creative Children’s Ministry.